Offer is available for recharges made by credit card, Visa or Mastercard Debit card, or PAYPAL, but does not apply to recharges made by voucher or Payclick. We are sorry, this is not available for iPhones, Tablets and Windows Mobile devices. See Terms & Conditions for full details. A: The offer is available to Optus Prepaid Mobile customers on their first online recharge of each calendar month through www.optus.com.au/recharge. Offer expires 31/7/2012. Q: How do I get my content? A: The offer will appear on screen after you recharge at www.optus.com.au/recharge, and must be accepted at that time. You will then be sent an SMS with a link to an online portal which you must access on your compatible mobile phone. The content must be downloaded within 48 hours of receiving the SMS with the link, from within Australia (otherwise international roaming charges including data charges may apply). Alternatively, you can choose to make the content available to a friend. Q: How much content do I get? A: Either 1 mobile game or 1 music track/song from the selection offered to you. 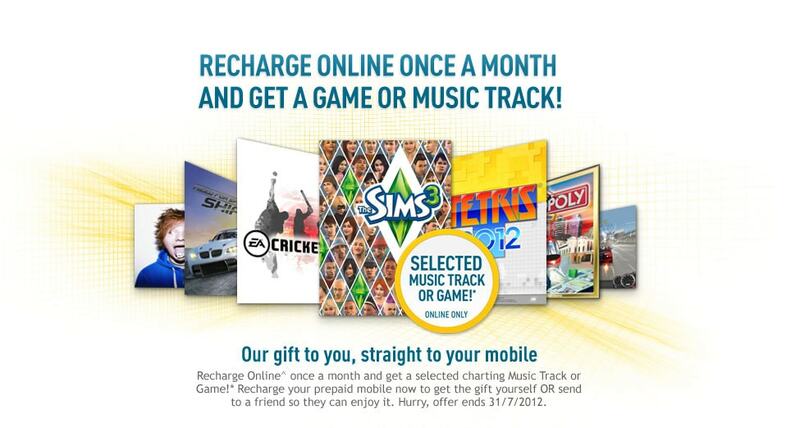 Optus chooses whether to offer you a game or a track/song. Q: What are the compatible handsets? A: Incompatible devices include iPhones, tablets and Windows Media devices. See http://www.optusmusicstore.com/DeviceCheck and http://www.optusgames.com.au/devicecheckfor details. Q: If I want to send the content to a friend, how do I do this? A: If you elect to send the content to a friend, you will receive an SMS to your phone which will include a link that can be forwarded to your friend’s mobile service. Remember, you accept all responsibility for sending that SMS to an interested receipt, and you won’t be able to download the content if you send to a friend. Your friend must download the content within 48 hours from when Optus sends the SMS to you. Q: Will I be charged the cost of the SMS if I send the content to a friend? A: Yes, you will be charged SMS costs in accordance with your rate plan. Q: Do data charges apply to download the content? A: If you download the content you will not be charged for any data usage. If you forward the content to a friend and your friend downloads the content, they may incur data charges. Q: Does the recharge have to be by credit card or will it work using a voucher? A: Recharges can be via credit card, Visa or Mastercard Debit card, or PAYPAL. Vouchers and Payclick transactions do not qualify for content. Q: Is there a minimum recharge amount? Q: I’m an Optus Prepaid Mobile Broadband customer. Can I access this offer? A: No. This special recharge offer is available online for Optus Prepaid Mobile customers only. Q: What happens if I don't receive the offer after I recharge, or am unable to download the content? A: Please write to us via CONTACT US with the following information (mobile number, date and time of download, error message) for assistance.